Blog How Much Is a Domain Name Worth? If you think this explanation can benefit your domain name sales negotiations, please share HowMuchIsADomainNameWorth.com with your inquiries or from your for-sale landing pages. The problem is: someone else owns the domain name you want. All good domain names are owned by someone. Like desirable physical land, great domain names hold steady or appreciate in value. Fair market value for great domain names varies from $X,000 to $X,000,000. Your business is successful and you want to upgrade from a suboptimal domain name to a great one. Without a doubt, the domain name you want is owned by someone else. It’s no different than looking for a desirable plot of land in New York City or on the coast of California to build your dream home. You cannot stake a claim today because all desirable land is already taken. Vacant land in California used to cost $1.52 an acre in the early 1800s, and vacant domain names used to cost $100 to register in 1995. It is no longer that inexpensive to buy premium real estate. In both cases – all the good physical and digital real estate has been registered and owned for decades because it’s highly desirable5. Every new home buyer has “sticker shock” when they realize how much real estate is selling for in their area. Even though New York City housing prices have experienced two periods of rapid growth and two periods of decline, prices increased by 250 percent from 1974 to 2006. As Figure 1 displays, a $143,000 studio condominium in 1974 was worth $500,000 in 2006 – which is a 250 percent increase in value. But surely this cannot apply to domain names, right? 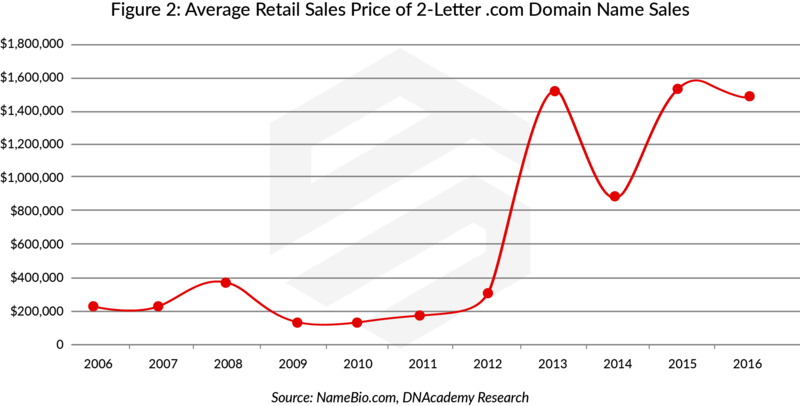 In the case of two-letter domain names like PX.com and HQ.com, average prices have increased from around $200,000 in 2006 to $1.6 million – which is an 800 percent increase in value, as seen in Figure 2. Latest @Mixergy interview w founder of @TuftandNeedle. @AndrewWarner: "How much did it cost you to get TN·com?" JT Marino (@johnmarino): "I'm bound by contract not to reveal that number, but I can say it was in the millions." Of course not all domain names are increasing in value by 800 percent. But in-demand, short, generic-word domain names like Amber.com and Wave.com have held their prices over the past decade, as seen in Figure 3. This is also the case for three-letter acronym domain names sold at a major domain name marketplace called Sedo, as seen in Figure 4. A domain name, also referred to as digital real estate, is very similar to physical real estate because you can build on it, lease it, exclude others from it, or dispose of it as you so desire. However, digital real estate comes with significant benefits – you don’t have to do maintenance like paint or put a new roof on it every 20 years. And you don’t have to pay yearly property taxes (only a domain name renewal fee per year of about $116). So how much is the domain name that you want worth? Now that we understand that all good domain names are owned by other people and that the values of these domain names has remained strong or increased over time like physical real estate, what are we to do if we want a good domain name? Contact the owner and make an offer to purchase the domain name. It’s not unheard of for house hunters in highly desirable real estate areas, like the Bay Area of California, to send letters to every homeowner on a street or on a residential block asking if they are interested in selling their house and making an offer. You, too, can employ this option to buy a great domain name. But you have to offer at least fair market value for the domain name if you want people to move. And you have to realize that some people won’t be interested in selling unless you go OVER fair market value. They’re not coming to you, you’re approaching them to buy the domain name. 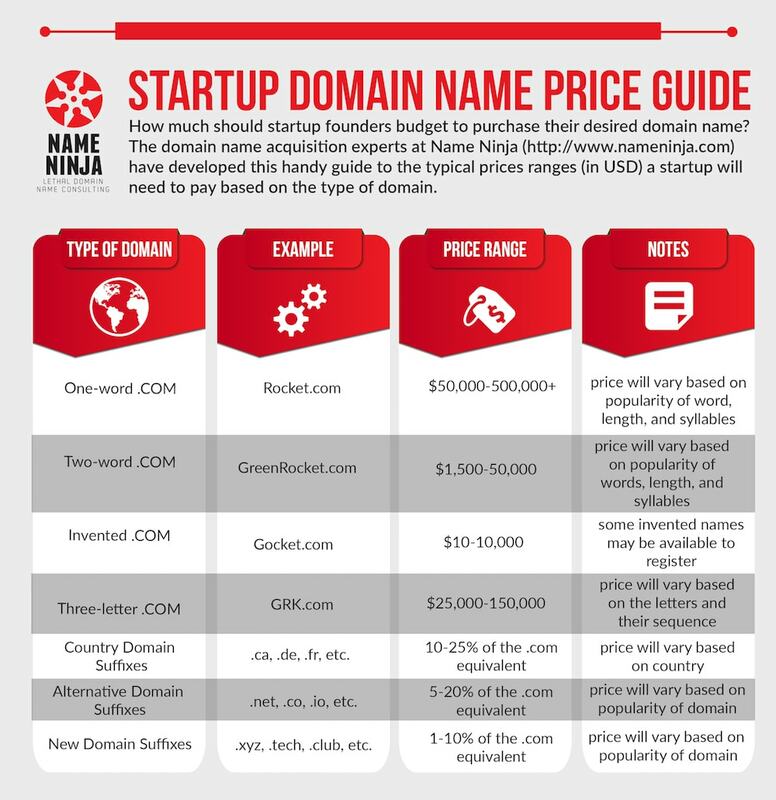 Name Ninja Startup Domain Name Price Guide Excerpt. Used with permission. Full guide. Keep in mind that these are general guidelines and domain names can go for more or less than the ranges provided. Noah Kagan, founder of marketing software SumoMe and daily tech deals provider AppSumo, purchased the Sumo.com domain name in 2017 for $1.5 million, with 50 percent cash upfront and 50 percent paid over the first five years. While these two examples might sound extreme, they are not. Short, one-word domain names can easily sell in the low seven figures. Facebook paying $8.5 million for FB.com in 2010 is what most people would consider extreme. You can browse additional sales from 2018 and 2017 to get a feel for recent real-world fair market values of domain names. So how do you get started buying the domain name you want? Start with a conversation by email or telephone with the current owner, like you would any other transaction, and tell them you read HowMuchIsADomainNameWorth.com and would like to discuss purchasing their domain name. If they are not immediately interested, don’t be discouraged. Plan to reach out again in six months. You might even let the owner know you will check in with them again in the future. Circumstances change – the owner can find themselves needing to liquidate for other expenses, for instance – so it’s worth contacting them again at a later time. You never know until you inquire. If the owner is receptive to a conversation about selling their domain name, remember that everything in life is negotiable, including the price of a domain name, payment timeline and payment schedule. The most common way to buy a domain name is outright with cash using an escrow service like Escrow.com. You are only limited by your creativity, communication skills and ability to negotiate. And like in physical real estate, you can hire a real estate professional to help you assess value7, contact the potential seller, negotiate without emotion, find a creative financing solution, and protect your funds during domain name transfer. They are called domain name brokers, and you’ll want to interview a few to find the one that best matches your drive and personality. In conclusion, if you want to live in one of the most desirable cities in the world, you need to realize that you will pay a premium. So it is with a desirable domain name. Having a great domain name may not lead to your company being acquired by Amazon for $1 billion like Ring.com, but it will definitely give you a host of immediate benefits including credibility with customers, investors, partners and suppliers. And even if your business falters, the value of your domain name – like physical real estate – will maintain or grow over time, and it’s an asset that can later be sold for the same or more than you paid for it. 1 Young, Rob D. “Exact Match Domains Can Double Clicks on PPC Ads.” Search Engine Watch Exact Match Domains Can Double Clicks on PPC Ads Comments, Search Engine Watch, 7 July 2011, searchenginewatch.com/sew/study/2086693/exact-match-domains-double-clicks-ppc-ads. 2 Ratcliff, Christopher. “What Is an Exact Match Domain (EMD) and How Can You Safely Use One?” Search Engine Watch What Is an Exact Match Domain EMD and How Can You Safely Use One Comments, Search Engine Watch, 28 Nov. 2016, searchenginewatch.com/2016/11/28/what-is-an-exact-match-domain-emd-and-why-does-google-want-to-punish-them/. 3 Leong, Samuel, et al. “Domain Bias in Web Search.” Microsoft Research, 1 Feb. 2012, www.microsoft.com/en-us/research/publication/domain-bias-in-web-search/. 4 If you’re a student starting a class project, you’re looking to start a hobby blog or you’re a startup with limited budget, you don’t need a great domain name. Go sign up for a free Wix.com website or register a multiple word .com, .co or .io. 5 Just because the domain name isn’t developed doesn’t mean it is less valuable. In many cases, it’s more valuable because it isn’t associated with a failing or marginal business. Or, it could be being used for email or other services. 6 Registration and renewals of .com domain names at Uniregistry.com. 7 See prior section. If you cannot assess a domain name’s fair market value, then hire a professional. Pro tip: don’t offer $100 or $500 on a $100,000 domain name; it will only get you ignored. This. is. awesome. Thanks, Michael! You. Are. Awesome. Thanks for reading and posting a comment, John! No its not true- all good domainnames are not taken! I have no idea what a “diomaininnovator” is, but I’ll take your word for it, Peter. 🙂 Thanks for reading. Love it. Makes our life so much easier. Thank you, Michael!!!! That’s my goal. I appreciate you reading and posting a comment. Feel free to link to HowMuchIsADomainNameWorth.com from your for-sale landing pages. I think it should help. the value of a domain……is always the Big question for domainer….